In antiquity, bracelets were usually worn in pairs. However, the number of surviving Greek and Etruscan bracelets is surprisingly small. 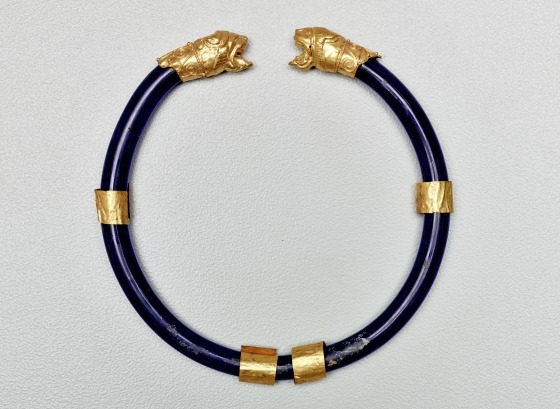 The blue glass hoop of this Etruscan bracelet terminates at each end with a lion head made of sheet gold. Behind the base of each lion head is a collar decorated with two spirals and a palmette in filigree. The four loosely fitted gold bands on the hoop slide back and forth. 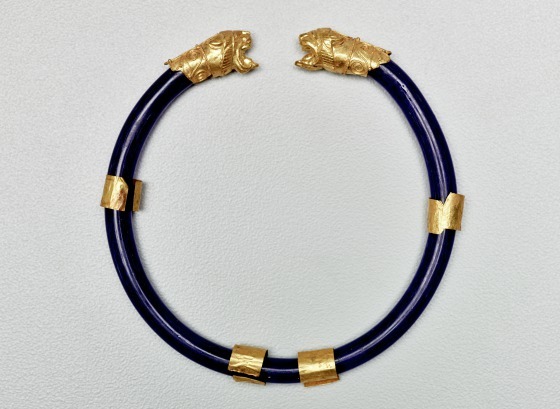 This is a very rare piece; one other complete example that has survived is a bracelet found in a tomb in Monte Autò_,_ now in the Museu di Villa Giulia in Rome. Fragments of glass hoops have been found in Italy, indicating Etruscan workmanship, though the style of these lion heads appears to be Greek. The Benaki Museum in Athens has a pair of animal finials in the form of rams from a necklace of the same type, but the hoop is missing. Depictions of lions were common in art all over the ancient world, from Egypt and the Near East westward. They had a range of meanings: royal power, fertility, guardian spirits, warlike prowess and triumph, and in some cases, perhaps triumph over death. Anne R. Bromberg, and Karl Kilinski II, Gods, Men, and Heroes: Ancient Art at the Dallas Museum of Art. (Seattle: University of Washington Press, 1996), 112. 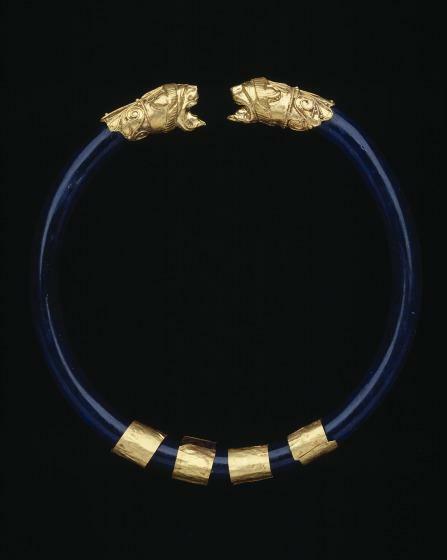 Barbara Deppert-Lippitz, Ancient Gold Jewelry at the Dallas Museum of Art (Dallas: Dallas Museum of Art in association with the University of Washington Press, 1996), 18; 36-37; 129. The use of glass on Etruscan jewelry is extremely rare. Jewelry was far more than merely ornament to the Etruscans; it was often close to being a magic charm or amulet and implied the protection of the gods.